It’s time for the Second Annual Bobby Darwin Awards, issued by this very website: VeryWellThen.Com. The award goes to the Twin with the fastest start within the first week to ten days of the season. 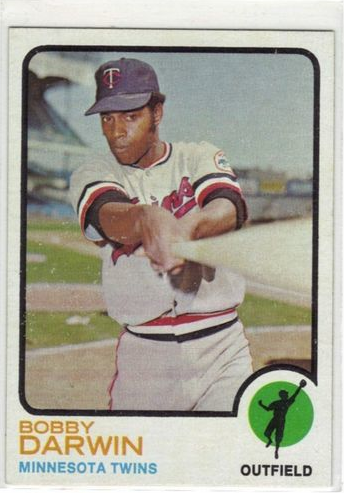 The award gets its name from Bobby Darwin — who debuted with a hot start as a 29 year old rookie center fielder for the Twins in1972, right around the time I was forming my first baseball memories. Darwin arrived with the Twins from the Dodgers organization for his first chance to play outfield at a major league level. He hit 5 home runs in his first 8 games. Darwin hit his 6th home run in game 12, but didn’t connect with his 7th of 1972 until game 45. Cousin Bobby had it down. In the end, Darwin had a respectable season — with 22 home runs and an OPS+ of 123. The Twins traded Darwin away in his fourth season with the team — perhaps tiring of his league-leading strike-out totals. Interesting aside: Darwin debuted for one game with the Dodgers as a pitcher at age 19. He would get 3 more pitching appearances with the Dodgers at age 26 before going back to the minors to reinvent himself as an outfielder. With last year’s atrocious start by the Twins, I had to look really hard to find someone to give the First Annual Bobby Darwin Award. I settled on Nick Blackburn for two early acceptable outings. That was for a team that started 3-6. This years’ Twins have started even worse. Three series into the year and the Twins stand 2-7. However, it is much easier this year to select the fast-starter. In a Bobby Darwin worthy start, Josh Willingham has 4 home runs, is batting .444 and his OPS is in the stratosphere at 1.508. According to an Aaron Gleeman tweet, he is only the fourth Twin to home 4 times in the first six games of the season. The other three: Kirby Puckett, Tony Oliva and, of course, Bobby Darwin. That’s two legendary Twins — Puckett in 1987 and Oliva in 1966 — having years where they were in the discussion for MVP. And one Twin who had a season that one young fan remembered enough to grow up and make up a silly blog award about. How do you think Josh Willingham’s season will turn out? Congratulations to Josh Willingham as the Second Annual VeryWellThen.Com Bobby Darwin Award winner. Let’s cheer for the Minnesota Twins today. Because these Minnesota Twins – the 2012 Minnesota Twins – might not be around tomorrow. I just took a look at the Opening Day lineup and I’m struck by how few players I see — at least in the starting lineup — as a reliable part of the Twins future. The same thing goes for the projected starting rotation (my feeling is amplified with newsflash update of Scott Baker lasting 3 batters in his minor-league start today). The Twins are very much a team in transition and in just two short years they may barely resemble what you see here at the beginning of 2012. Take a look at the 2012 Opening Day starting lineup and the projected five man rotation and who do you reasonably expect to be on the team in two years, when the 2014 season starts up? Well, Joe Mauer won’t be going anywhere – there will still be 5 more years at $23M per owed to him. He’ll still do the 2014 ceremonial opening day squatting at catcher, but will likely start seeing more and more time at other positions. Josh Willingham will have one more year on his contract. Ryan Doumit is committed to just one year. Call him a ‘Journey-man’ – he’ll be going his Separate Ways (Worlds Apart). Jamey Carroll is committed to two years plus an unlikely-to-be tapped 2014 option. He certainly won’t be an everyday middle infielder at age 40. It’s reasonable to question whether either of the Concussion Twins will be every day Twins in 2014. Justin Morneau will be a free agent and 2014 will be the final non-option year of Denard Span’s contract. The Twins are as loyal as an MLB team gets, but extending on Morneau makes little sense from today’s perspective. Span is the more likely of the two to be starting on Opening Day 2014, but that’s a dicey proposition, too. Alexi Casilla will be a free agent and likely not worth the pursuit. Valencia will be entering his first year of arbitration (translation: muy caro) – right about the time that super-prospect Miguel Sano will be knocking down the door of third base. Parmalee will still be cheap – the question remains if he has what it takes to be a full-time bat at first base or DH. That’s the 2012 opening day starting lineup. Projecting any current starters onto the 2014 rotation isn’t a good bet either. Pavano and Liriano will be free agents* after this season, Baker after the next. Marquis is probably a one year gap-filler. Blackburn has a 2014 option that I hope the Twins will recognize as over-priced. * For all the free agents, remember that under the new collective bargaining deal, offering arbitration is a much worse bet for teams since only really expensive team offers (i.e. no Twins offers) will bring back any compensation picks. So the Pavano-style one-year-at-a-time deal at arbitration prices is a thing of the past. So the starting Twins of 2014 might only have Mauer and a lame-duck Willingham from 2012’s opening starters. Of course the Ghost of Opening Day Future will contain spirits from the Ghost of Baseball Season Present, as likely 2012 contributors Plouffe, Dozier, Benson and Hendricks will be asked to step up to lead roles by 2014. Still, that’s not a lot of continuity. On the bright side, the Twins will have flexibility with only 14 Million non-Mauer dollars presently on the 2014 books.